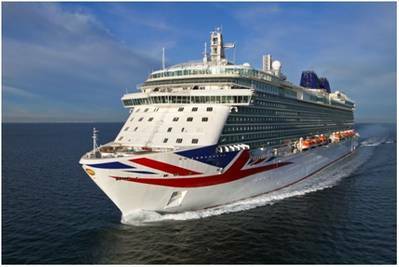 Intertek’s Farnborough laboratory is supporting P&O Cruises’ new flagship Britannia by providing independent oil condition monitoring (OCM) services which monitor the condition of Britannia’s engines and other oil lubricated systems. Britannia, the largest cruise ship designed exclusively for British holiday market, set sail from Southampton last month to fulfill a busy timetable of Mediterranean cruisers which does not allow for unexpected engine and machinery repairs or time out of service. Lubricant quality scan (LQS) at Intertek Farnborough provides OCM services for the whole UK P&O Cruises fleet. LQS is a specialist marine focused service which has been providing OCM services to maritime and cruise ship companies, oil rigs and offshore platform and asset management companies for over a decade. This service helps to prolong the life of the thousands of liters of oil used in engines and other system, as well as detecting potential faults before they lead to catastrophic failures. Intertek LQS’s experts provide in-depth interpretation of data, using years of specialist marine OCM experience. LQS is one part of Intertek’s global OCM service, and further to the marine focused OCM, the global OCM program helps aviation, rail companies, wind turbine operators, shipping, automotive and other clients. Operating on a global basis, Intertek OCM labs offer detailed oil and lubricant testing, presented in easy-to-read and understandable reports. The laboratories provide expert oil analysis, including spectrometry, viscosity, dilution, water detection, acid number, base number, particle counting and microscopy analysis to accurately test lubricant oil samples.